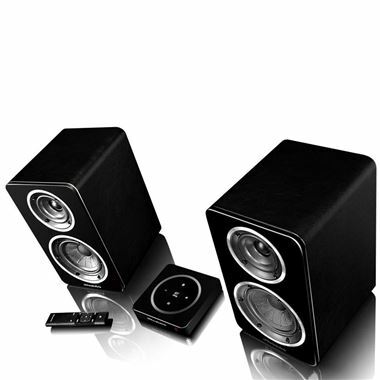 Wharfedale Diamond A1 Active Bookshelf Speakers Inc. H1 Hub. Available with Online Finance and Free Delivery. There is no need for bulky amplifiers and trailing wires anymore. The Diamond A1 system consists of 2 x bookshelf speakers and the included Diamond H1 Hub, which acts as the central console for all your music sources, including analogue, digital and Bluetooth aptX connections - Everything the modern music lover needs. The speakers are Individually powered by the latest in digital amplification - a room-filling 100W per system. Combined with Wharfedale’s proprietary Woven-Kevlar bass driver and textile soft-dome tweeter as seen in the multi-award winning Diamond 200 series the result is a jaw-dropping sound, usually associated with more complicated audio setups. Unlike other wireless and active speakers where controls and inputs are often placed awkwardly on the back panel, Wharfedale engineers have developed a unique hub, which works as the central console for your music. The Diamond H1 Hub features Optical, Coaxial and RCA inputs on the rear panel with an additional Bluetooth aptX connection for wireless integration of laptops, smart phones and tablet devices. It’s controlled gracefully via the touch sensitive display, or for even more convenience you can use the included remote. Once connected to your source, the Diamond H1 Hub works independently from the speakers using the 5.8GHz wireless frequency band. To ensure the same high standard of sound as conventional wired audio systems, Wharfedale engineers have utilised an advanced wireless module, operating on the 5.8gHz frequency band. While avoiding the often crowded 2.4gHz band, the Diamond Active system is able to switch intelligently between frequencies, guaranteeing minimal interference, wherever your speakers may be placed. Additionally, the DAC is built around a high performance 24bit chipset delivering a CD-like quality from all devices.